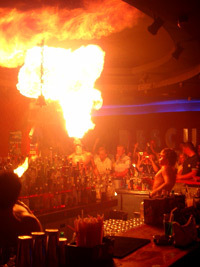 The real centre of enjoyment and of night life in the island. At the beginning the town developed along the main street, about 3 kms taking to the beach, nowadays Lagans is expanding very quickly and it is better and better equipped for young and for tourists who want a holiday of enjoyments. In winter the town is deserted but during the summer there are many hotels, night clubs and souvenir shops and supermarkets open from early in the morning to late at night to satisfy every tourists’ interests. Even restaurants and snack bars have very long opening timetables and you can find them in the town main streets and along the beach. The beach is a very long sand tongue very well equipped for the tourist; it is possible to rent deckchairs and sunshades, to organize tours to the island of Marathonissi and to the close cave of Kerì and furthermore for the divers the possibility to make unforgettable diving. Definitely the “youngest” and more commercial beach of the island. 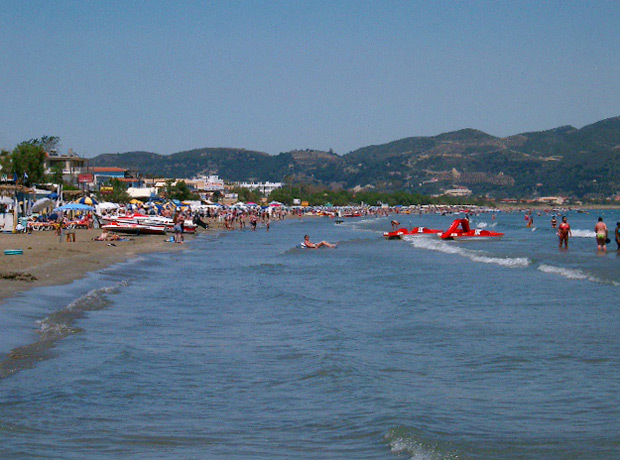 The beach is so long that joins the beach of Kalamaki and it is full of restaurants and snack bars open from the morning to night. The sea, even if not as spectacular as in other parts of the island, is very warm and crystal clear with a short deepness even far from the beach! Laganas is connected to Zakynthos and Kalamaki by bus with many daily runs. Furthermore there are many places where it is possible to rent cars, jeeps, motorbikes or bicycles to move around the island. Now they rent also quads. There are many shops in Laganas and of every kind, souvenirs shops, jewellers, opticians, pharmacies and many others. They are all together with pubs, snack bars, shops and taverns on the main street. Laganas is synonymous of enjoyment and differently from other towns after two in the morning you can still dance and drink enjoying other people’s company. There are free entrance discos and two floors pubs where to spend the night listening to the music. Pubs and restaurants are even along the beach facing the turtles gulf. Laganas is a town of medium dimensions offering different lodging solutions such as the many hotels with swimming pools, studios and there is also a camping. Here you are in the middle of enjoyment and we suggest it to those who do not like to sleep at night. There are two types of villas one smaller for 4 persons and one bigger for 7 persons. Villa Zoi is set in a beautiful garden and just few steps from the sea. This villa can accommodate 6 persons.